Darren Hartwell’s specialty is returning punts and kickoffs. Last weekend, in a 29-21 win over NESCAC rival Trinity, the Williams sophomore showed he has a knack to catch a pass, too. The TD receptions — all from senior quarterback Pat Moffit — covered 83, 89, and 25 yards and tied Hartwell with four other Ephs for most touchdowns in a game. It was the 83- and 89 yarders in the second quarter that generated the most buzz. They were carbon copies on back-to-back passes. By game’s end, Hartwell had piled up 294 yards of offense: five catches for 208 yards, three punt returns for 20 more, and three kickoffs for another 66 yards. 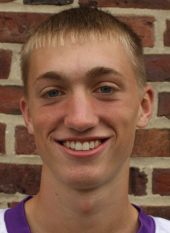 Williams loves to run the football, but the Ephs have a potent passing attack. Jack Welch, whose career as football coach at Ipswich High spanned 36 years and produced 224 wins, eight Cape Ann League and five state championships, headlines the inaugural class of the school’s athletic hall of fame. Welch, who is already in the State Football Coaches Hall of Fame, will be inducted with nine others on Nov. 26 at the Hellenic Community Center in Ipswich. They include former athletes Phillip Robishaw (class of 1940, football); Edward Mackey (1941, baseball and basketball); Ruben Britt (1970, basketball); John Galanis (1972, football); Jayne Benirowski-Canty (1979, basketball); and Brett Budzinski (1993, football, basketball and track). Two former coaches will be honored: C. Elliott Roundy, who coached football, basketball, and baseball from 1951-1983, and Ann Papagiotas, girls’ basketball coach from 1970-84, who led her teams to 10 Cape Ann League, six Division 2 and 3 North, and two state championships. John Thomas, Ipswich sports historian and statistician, will also be inducted. Mackey, Robishaw and Roundy will be inducted posthumously. Buy tickets by calling Hall of Fame committee members Doug Woodworth (978-356-9359) or Dan Follansbee (978-356-4634). Senior back Mia Muzio of Rockport is the captain of the Ithaca field hockey team. Last season she was an All-Empire 8 selection, starting 16 of 17 games and contributing at both ends of the field. . . . Norwood native Jim Martin has been named head baseball coach at Merrimack after serving as an assistant at Northeast-10 Conference rival Southern Connecticut State University for five years. He succeeds Joe Sarno, who resigned last month after seven years. . . . UMass-Lowell men’s basketball coach Greg Herenda has added Tom Glynn and Jen Valente to his staff. Glynn comes on as assistant coach after a similar role at Arlington High and Cambridge School of Weston, and Valente joins as a graduate assistant. She captained the River Hawks last season. . . . Connecticut College senior Trevor Prophet of Nashua scored four more goals last week to up his NESCAC-leading soccer ledger to seven goals and 15 assists. . . . Salem State junior Alex Gomes was MASCAC Runner of the Week after individual honors at the Gordon Pop Crowell Invitational. . . . MASCAC honored Salem State freshman Jovan Sempa of Woburn as soccer Player of the Week after his goal and assist in a win over Framingham State. . . . Matt Grimard of Dracut is the Presidents’ Athletic Conference offensive Player of the Week after leading Bethany College past Waynesburg, 24-17. The quarterback passed for 173 yards and rushed for 83 more. Jessica Farzan of Andover, Michelle Parece of North Reading, Katrina Katsoulis of Methuen, Lillian Anderson of Atkinson, N.H., and Ashley Rooney of Hampstead, N.H., represent Colonial Figure Skating Club of Acton at the New England Figure Skating Championships this weekend in Simsbury, Conn. It’s a prequalifier to the 2011 US Nationals in Greensboro, N.C. . . . Girls ages 7-12 can try synchronized swimming Oct. 19 at the North Shore YMCA Sterling Branch in Beverly. Girls should be able to swim at least 25 yards and be comfortable under water. Call Carol Meyer at 978-564-3904. Send ideas or information to JohnPVel@aol.com.